The Cancer Institute is dedicated to providing fully integrated, multidisciplinary cancer treatment under one roof with state-of-the-art technology, having assembled a wide range of experts in all disciplines related to cancer, from various parts of the country and abroad, to form an integrated team to treat the disease. The Radiation Oncology Department is composed of a dedicated team of Radiation Oncologists, Medical Physicists, Dosimetrists and Technologists for diagnosis, treatment planning, precise execution of the radiation therapy and on-going patient management. The Department is equipped with a full range of state-of-the-art radiation therapy equipment, computer planning systems and quality assurance technology. Linear Accelerators with Multileaf Collimation, and Electronic Portal Imaging for real time quality assurance of the region receiving radiation. Each accelerator is equipped with three photon and a full set of electron energy beams. Computerized treatment planning system with CT/MRI/PET fusion and virtual fluoroscopy. This comprehensive system allows for both CT- based 3-Dimensional and Intensity Modulated Radiation Treatment (IMRT) planning. CT simulator with a moveable lasers system for precise patient set up. Tonight is Kartika. 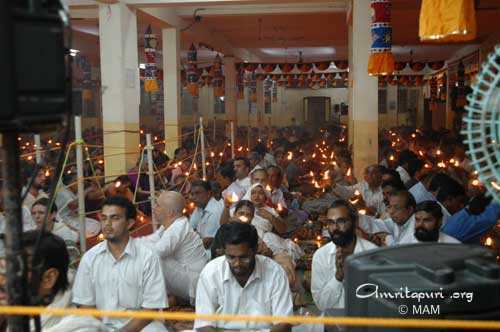 As always on the night of Amma’s birth star, the ashram was alit with various lights and candles, in particular, the pathway Amma follows from Her room to the bhajan hall. Towards the end of the night’s set of bhajans, Amma surprised everyone by practicing a new song in Telegu “Ni Raanjanam,” meaning arati. 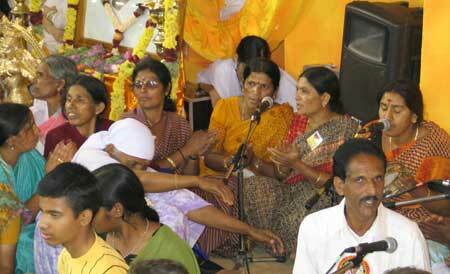 She then finished off by singing “Amma Amma Taye,” a treat for all the devotees. 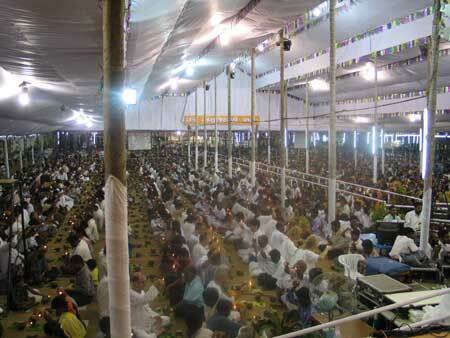 The last stop on Amma’s South India Tour began today in Coimbatore, at the Brahmasthanam temple. These next three days will enjoy a Brahmasthanam Festival complete with the regular planetary pujas and archanas, and Amma’s bhajans, satsang and darshan. 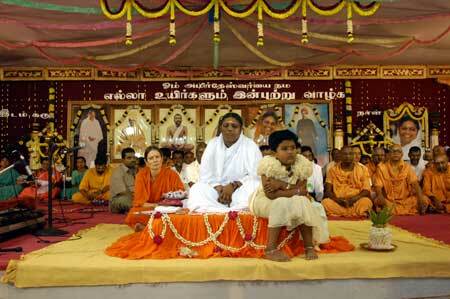 This evening’s programme began with the garlanding of Amma by local VIPs. Member of Parliament Shri. C.P. Radhakrishnan, the Mayor of Coimbatore, Shri. T. Malaravan, and Coimbatore’s District Collector, Shri. N. Muruganandam IAS, all received this blessed opportunity. The esteemed guests were then welcomed with the presentation of bouquets. A special souvenir publication was released. Also highlighted tonight was the inauguration of another Amrita Nidhi pension program. After the traditional lamp was lit amidst the chanting of verses to Ganesha, Shri. C.P. 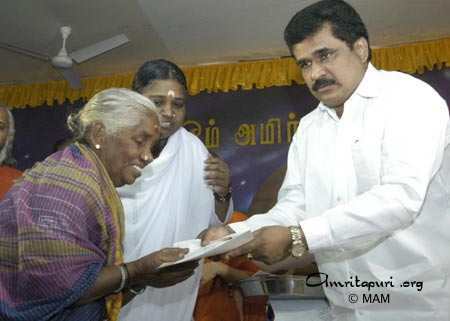 Radhakrishnan distributed the pension certificates to 10 widows from the surrounding region. Thus was initiated the local phase of this renowned pension scheme, which is bringing a welcome amount of relief to many such unfortunate women across India. Afterwards, Amma gave satsang and led bhajans before commencing with the evening’s darshan program that continued until sunrise. From the big city of Chennai, to the smaller, former French enclave of Pondicherry, to the even smaller town of Karur, traveling with Amma provides a truly cosmopolitan view of India. There is the continual shifting of surroundings, the never-ending flux of the multitudes from every conceivable walk of life, and the ever-new circumstances and situations to adapt to!! it can all be a very intense experience, even overwhelming for some. But, Amma never flinches, or even slows down. She remains the same supremely steady Amma throughout – never changing, never wavering even a bit, ever established in a perfect equanimity and peace. Her smile, Her radiance, Her total selflessness is the constant around which all of these other variables revolve. The crowds are always huge and a mixture of people, but each tour stop has a characteristic that stands out. Chennai, being a large, upwardly mobile international city, naturally has a high concentration of the affluent and influential; Pondicherry, though a more relaxed town, still had an unexpectedly large turnout, with a larger than average percentage of westerners attending due to its foreign and expatriate population; Karur on the other hand is smaller and more impoverished, and the crowd here consisted almost exclusively of very poor villagers. Amma and the tour group were accommodated at the Sri Sarada Niketan Women’s College, for which Amma laid the foundation stone 18 years ago. This is Amma’s first return to what has become a beautiful campus. As the buses pulled in, we were greeted with a sign quoting Sri Sarada Devi: “Pure, loving devotion can win everything.” The grounds of the college are very beautiful, with the many buildings constructed in a traditional Tamil architecture style?? and pink like Amritapuri! In the college’s large prayer hall was an altar with a large photo of Amma, centrally erected amidst photos of Sri Ramakrishna, Sri Sarada Devi, Swami Vivekananda, and about 50 paintings of Hindu deities adorning the walls. Local students had delicately decorated it with tiny pearls covering Amma’s white sari and colored beads overlapping Amma’s nose ring and malas. Many among the tour group found this hall a favourite sanctuary for prayer and meditation. A few kilometers away at the program site, held at the Vivekananda Higher Secondary School, the crowds swelled to massive proportions. They consisted almost entirely of poor local villagers, all eager for their turn in Amma’s arms. 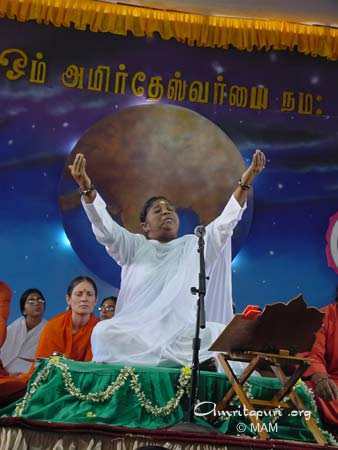 There were three huge portraits of Sri Ramakrishna, Swami Vivekananda and Sharada Devi surrounded by two big portraits of Amma creating the backdrop of the stage. 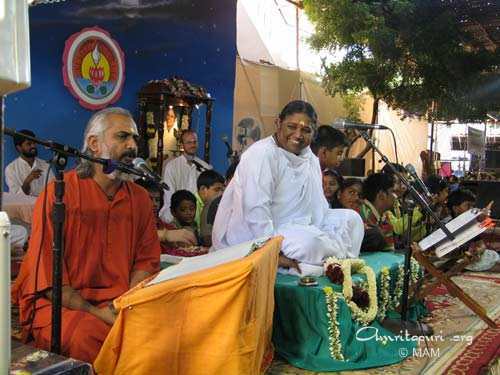 At one point late into the program, Amma called all of those with high darshan token numbers, who would otherwise have to wait many more hours for their darshan turn, to come sit on the stage near Amma in rotating groups. 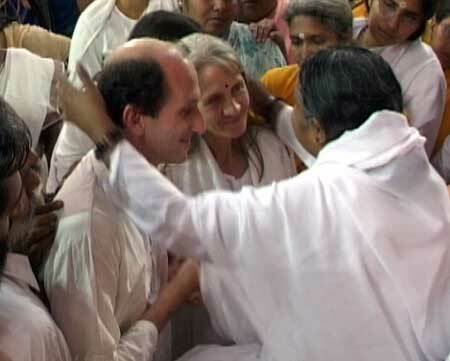 Amma also invited them to queue in the prasad line, where they were able to spend a few moments each handing prasad directly into Amma’s hand, as She hugged the endless lines of devotees. Many seemed almost perplexed at their good fortune. The students from the Sri Sarada Niketan were also given this chance, and double rows of purple, green and pink saris, the colours denoting student and staff, could be seen winding off the stage and far out onto the grounds. At 9:38 am, Amma stood after having hugged 40,000 of Her Karur children since coming to the stage at 6:30 the previous evening. 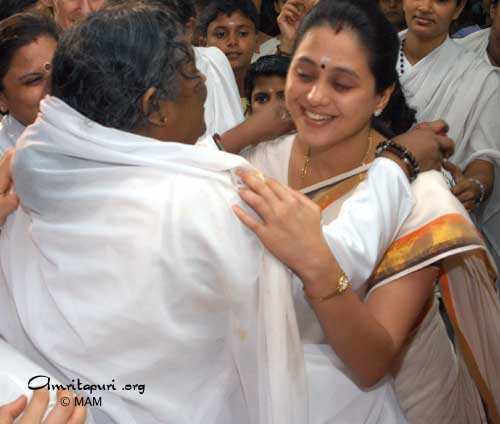 Even after standing, Amma couldn’t resist the many outstretched hands of those of Her children below who had just begun arriving, all reaching longingly for their Amma. 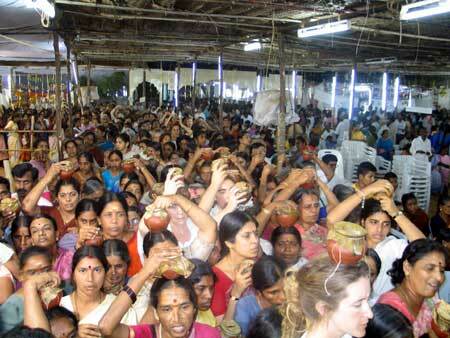 She stood at the edge of the stage for many more minutes passing out prasad to as many as possible. Amma even blessed three boxes full of prasad, to be distributed amongst all who had just come and didn’t receive a hug. Over 3,000 students of the school had also begun arriving for class, and were amazed and excited at the crowds and festive atmosphere. As the crowds encircled Amma’s travel camper for one last glimpse of their beloved, Amma made Her way into its doorway, and lingered there, seeming to hesitate leaving Her children. Even though Amma was inside and the door was ready to be closed, Amma kept pushing it back open, to give another loving glance. The school’s students lined Amma’s path as She drove out of the grounds, holding their palms together in reverent salutation before Amma. Sitting in the front seat, Amma lovingly gazed out through the windshield at them all as She was slowly driven out. 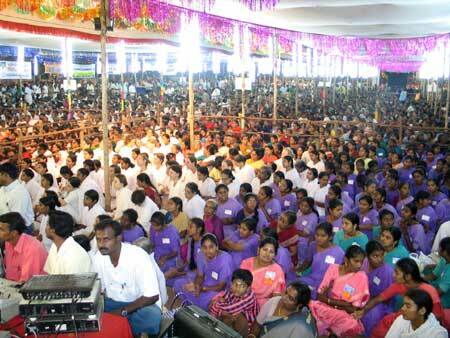 An unexpectedly large crowd of Amma’s children came to see Her in Pondicherry. More than 37,000 darshan tickets were issued on Amma’s first visit to this former French colony, and darshan lasted until 9:30 am. 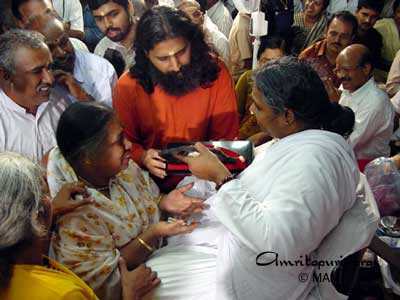 Even after darshan was over and She was standing from Her peetham to leave, Amma remained to serve Her children yet a little longer. Though She had come to the stage at 6:30 pm the previous day, Amma still kept giving out prasad to those who had arrived as darshan was ending, just minutes before. Pondicherry hosts a strong spiritual tradition, being the home of one of India’s greatest philosophers, Sri Aurobindo. His ashram is located here, and his main disciple and collaborator, the French mystic popularly known as the Mother, founded the nearby Auroville, an experimental ‘new age’ town that has attracted many westerners. 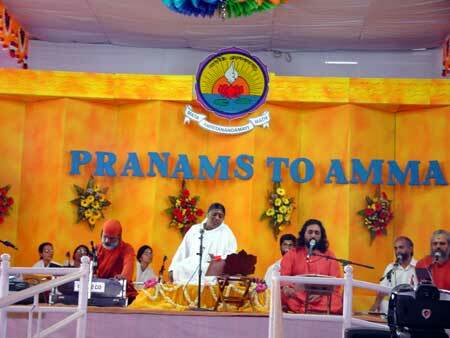 Amidst this evening’s line-up of Tamil bhajans, Amma sang a bhajan in French as well. 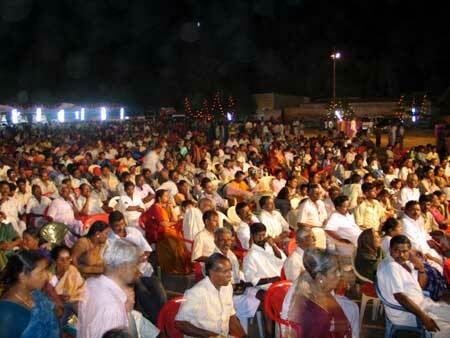 The stage in Pondicherry was full with dignitaries on Amma’s very first visit to this coastal town: the Lt. Governor, the Chief Minister, the ex-Chief Minister, the Opposition Leader, the Inspector General of Police and many more. The Lt. 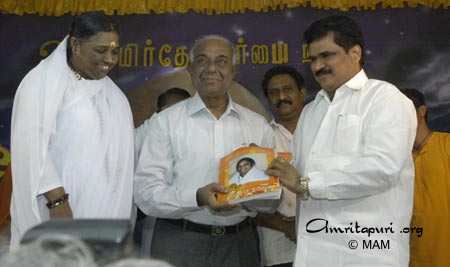 Governor of Pondicherry, Shri. 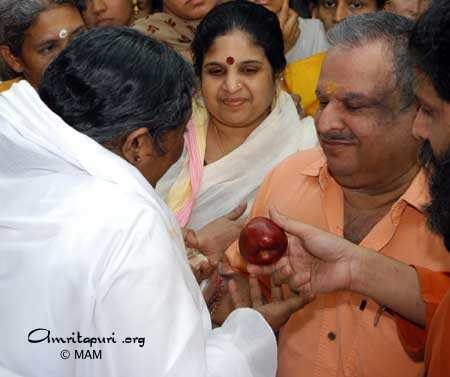 N. N. Jha, was genuinely touched by his first encounter with Amma: “It was the first meeting with Amma for me and my wife and it was a very moving and enlightening experience. It was inwardly very moving!” In his speech the Lt. Governor said that he was overwhelmed and honored that Amma was blessing the people of Pondicherry with Her presence, saying, “I hope that Her visit will promote peace, amity and brotherhood among the different sections of people in the Union Territory.” The Lt. 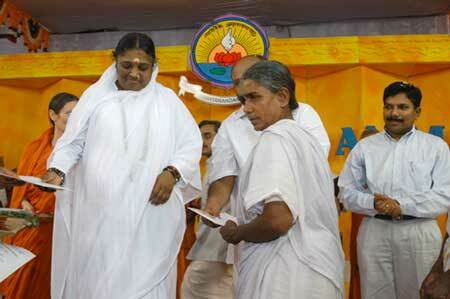 Governor asked Amma to start an Amrita Kuteeram housing project in Pondicherry and Amma immediately agreed! The Amrita Nidhi pension scheme was also introduced this evening, with the distribution of pensions to the 15 widows selected as the local program’s initial beneficiaries. These women all share especially sad circumstances: they were widowed by husbands that had all committed suicide. 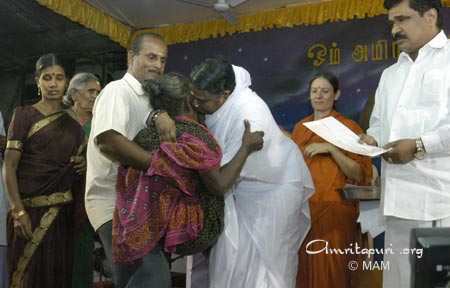 Amma is always extending Her consoling touch to those that need it the most. O. Rajagopal, Union Minister of State for Defence and Parliamentary Affairs, Ministers E. Valsaraj, A. M. Krishnamoorthy, M.L.A, and many others also received blessings from Amma. Amma left the stage in Rameshwaram at 9 am yesterday morning, and after a brief stop at a nearby devotee’s home and then a visit to the holy Rameshwaram Temple, immediately departed for the next stretch of the journey — onward towards Chennai! 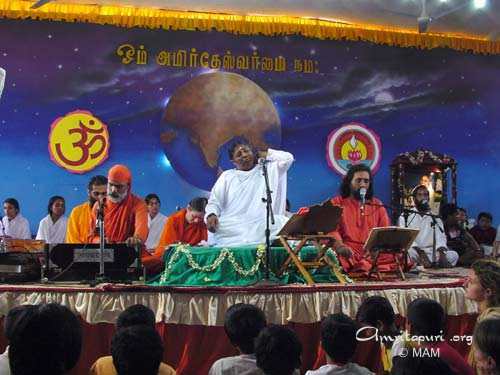 As this would be a long distance drive — over 350 km — there was a sleepover midway in the small town of Sivaganga where a devotee hosted Amma and those traveling with Her. Rested and fed lovingly (and well!) 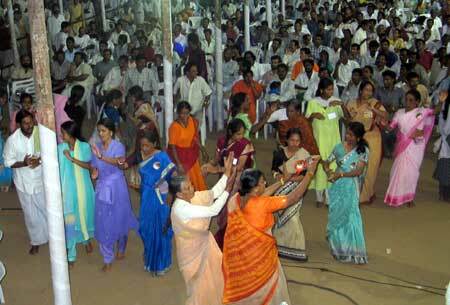 by Amma’s local Sivagangadevotees, we started off refreshed at the next dawn. One of the most cherished features of touring with Amma is the occasional roadside stop that is made, where Amma will serve lunch to everyone and give satsang. 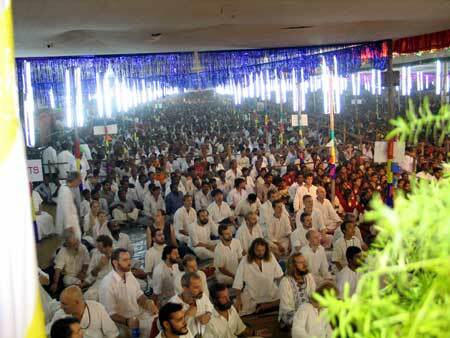 It’s exceptionally intimate, as there are never more than a few hundred devotees and ashramites on tour at a time. 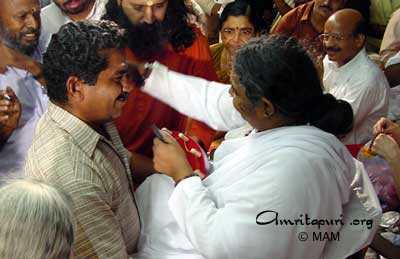 Around Amma, this is a rare number, and the intimacy of these stops is always memorable. Today a nice shady spot under a tree-full of monkeys was found. One of the first things Amma did was talk to these curious creatures, who were no doubt wondering what all the fuss was about! “Namah Sivaya” Amma called out to one of them watching us from above. He responded by either offering namaskaram with his hands, or scratching his nose?? it was hard to tell. Amma then offered everyone lunch with Her own hands. Those of the group that bring their own tiffins write their names on its side, so that Amma can read it out for them to come get their prasad. Sometimes people forget to do this, and instead of a name there’s a sticker of some kind, or a manufacturer’s label, or nothing at all. Then, like today, Amma calls out, “Post No Bills! Where are you, Post No Bills?” or “Sagar Housewares!” or for the blank vessels, “Nobody! Come get your food, Nobody!” It’s always very funny, and Amma especially gets a major kick out of this. Her innocent, unrestrained laughter sends contagious ripples through the gathering. 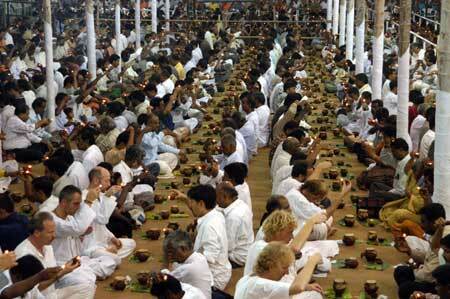 After our food, Amma asked us to explain the cause of the world’s suffering, and the way out of it. One person said that we suffer due to having desires and expectations. When these aren’t fulfilled, we experience sadness or anger, and through this we lose our happiness and peace of mind. Another person added to this, saying that by having expectations we are creating a division between ourselves and the Lord. It is this sense of separation that is the real source of our suffering, and the only way to go beyond suffering is to remember our oneness with the Divine. When there is only One, there can be no desire or expectations, and hence no suffering. 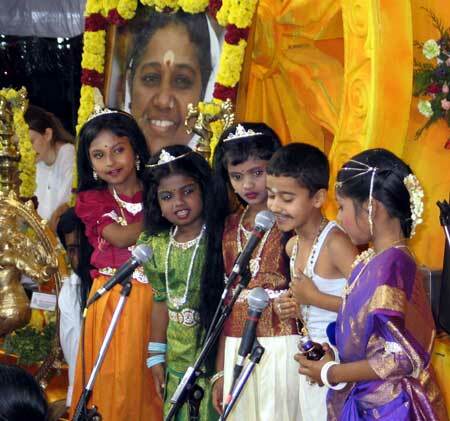 A young woman mentioned very sweetly that Amma’s children are always so eager to serve Her, and that this is good? 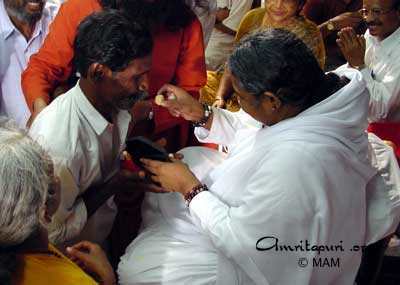 But Amma wants us to see Her in everyone, and to love and serve them with that same enthusiasm and humility. 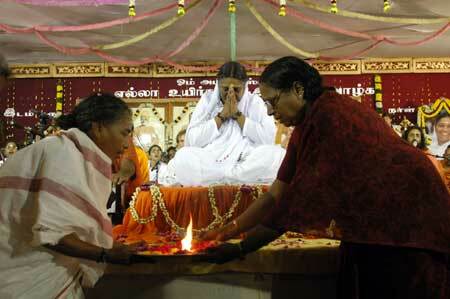 She told Amma that this is hard sometimes, and asked Amma very prayerfully for the strength to do this better. A small group of very poor local villagers who happened to live nearby also came out of curiosity over the sudden crowd. Amma arranged for meals to be given to them as well, and as She was walking toward Her car to leave, gave each of them prasad and asked after their well-being. Then, with amazing efficiency, the entire scene was restored to it’s original non-descriptness. Supplies were quickly loaded and no trash or any evidence other than our dusty footprints, a peaceful air and the rumours of monkeys was left to tell of our visit. Amma and the group were quickly off, to be in Chennai by nightfall. It happened totally unexpectedly. Darshan had only ended a few minutes earlier at 9 in the morning and Amma’s caravan had just left the site of Rameshwaram’s Amritakuteeram site, adjacent to the darshan hall, only minutes later. Some of us chose to walk back to our accommodations, and a lucky choice this turned out to be, because soon there was a complete traffic jam as Amma’s caravan briefly stopped to visit a house on the way. And then the news came: Amma is going to visit the Temple! The Rameshwaram Temple is one of the major pilgrimage sites in South India. It is the place where Lord Rama began to build a bridge across the sea to rescue his wife Sita from her abductor, Ravana, the demon king of Lanka. It is also the place where Rama worshipped Lord Shiva to absolve himself from the sin of killing Ravana, who, though a demon was also a Brahmin. It houses one of the twelve Jyotirlingams of India. Lingams are the symbol of Lord Shiva and these sacred twelve are believed to emit light (‘jyoti’ means light). For as long as time can tell pilgrims have brought water from the Holy Ganges in Varanasi to pour here off the coast of Rameshwaram in the Bay of Bengal, just as pilgrims take water from the beach of Rameshwaram to Varanasi, symbolizing the unity of India and the One-Divinity-in-All philosophy of Sanatana Dharma. Amma’s car drove around the 1 sq. km temple complex towards the front gate. There She was welcomed with Purnakumbham by one of the temple’s chief priests and the executive officer who garlanded Her and escorted Her in. Immediately, hundreds of people came from all directions: those lucky devotees of Amma who had heard about the visit, but also many Swami Ayyappa devotees who came for the bathing ceremonies in the temple’s 22 wells. Waiting in the long queue for the darshan of the Lord of Rameshwaram, many left their spot in line, choosing to have Amma’s darshan first. 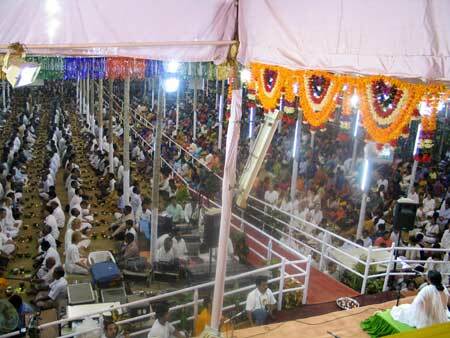 Amma passed through the main gate, passing the huge ancient corridors with the 1,212 columns that surround the temple. It was built in the year 1717 and it took 30 years to complete the structure. On Her way to the sanctum sanctorum, Amma first made Her way to a small shrine to Ganesha. 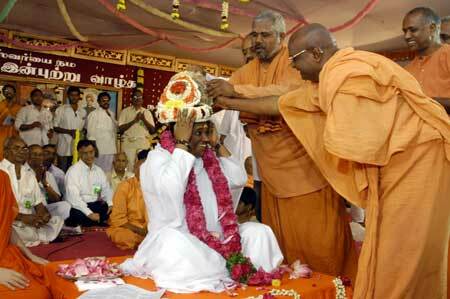 The priest performed arati for the deity and garlanded Amma. As groups of ashramites formed a path for Amma to walk through, She went on to a little temple still deeper within this ancient House of God. 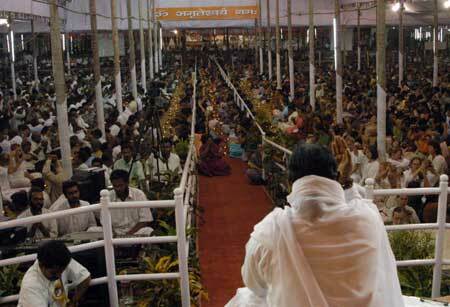 Amma’s amazing presence of mind astounded everyone as She, though unable to have seen anything because She was surrounded by tons of people, suddenly stopped and turned sideways, crossing right through the crowd. There, even though none of us had noticed, was a young spastic man, his body tangled in a cramped position and his tongue hanging out of his mouth. Amma hugged him immediately and kissed him. 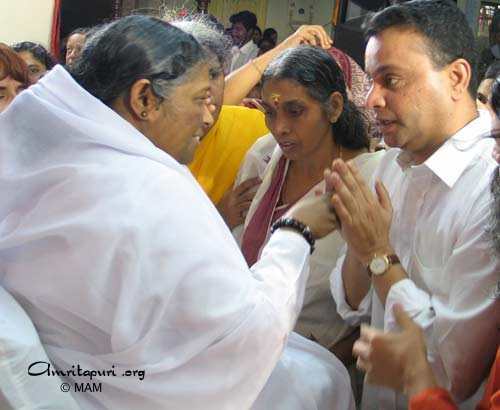 Here we find Amma as always living Her teachings, as we recollect Her words on how it isn’t enough to piously visit a temple while scorning the beggars at their gates. 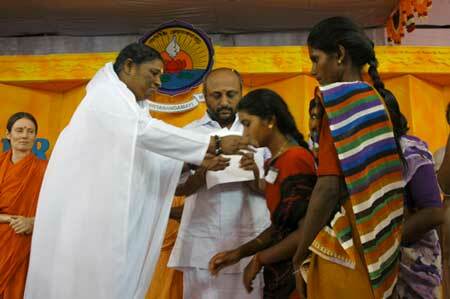 Amma says that service to the poor and suffering is real service to God. 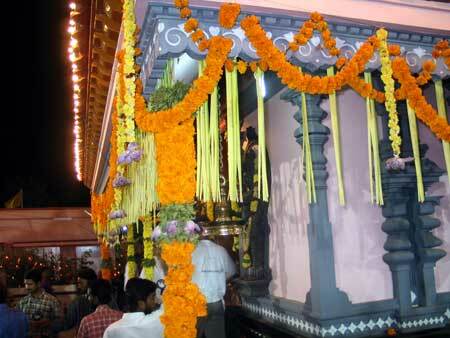 Then She went on through the narrow passageways to the next shrine. Up and down the steps, Amma was speeding up and everyone seemed to be running to keep pace, trying to be careful of slipping on the floor, which was wet from its famous 22 bathing teerthas. The many temple pujaris were waiting for Amma to arrive at the main shrine that houses the Jyotir lingam, one of the holiest places in all of India. They made sure only five people entered as they closed the gate to give Amma a moment of silence in this wild, streaming mass of people. As they garlanded Amma, performed arati, and offered bilwa leaf and water from the sacred Ganges, Amma closed Her eyes and seemed miles away in samadhi. 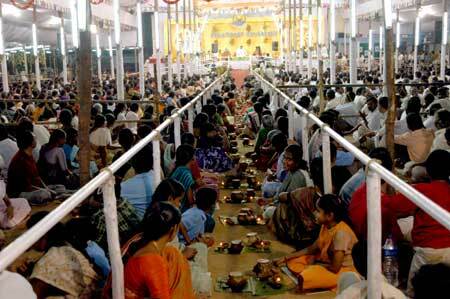 Then they all reverently queued for Amma’s darshan. Amma then stepped out and the winding group of people ran after Her through the inner parts of the temple, which consists of small dark alleyways. 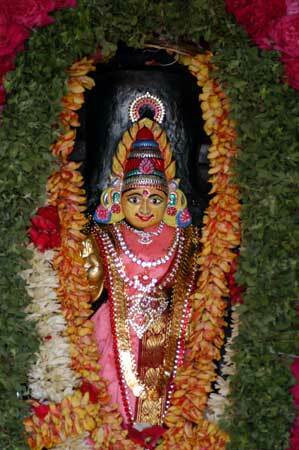 She next went to Devi’s shrine, where the priest again garlanded Amma after arati and offered kumkum and a Sri Chakra. The Sri Chakra is a sacred tantric symbol of Shakti, and this Sri Chakra of Rameshwaram is brought out for viewing only once a year during the Navaratri Festival. So sacred is this that at no time is anyone allowed to even touch this holy icon. 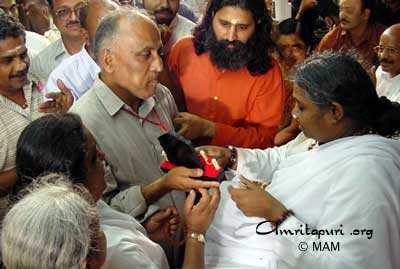 But here, the priests bring this Sri Chakra out especially for Amma. Amma touched it reverently with both hands. 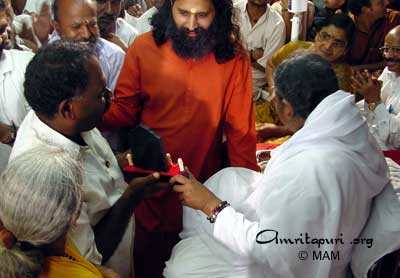 The priests then received Amma’s darshan. Just on the western side of the temple, Amma stopped at the shrine of Lord Nataraja. Here more than 100,000 large rudraksha beads have been strung together to form a temple for Nataraja, Lord Shiva in His act of the Cosmic Dance. This small temple is also the site where the ancient Rishi Patanjali, author of the famous Yoga Sutras, performed austere tapas. Here too Amma was garlanded, and offered some sacred ash. 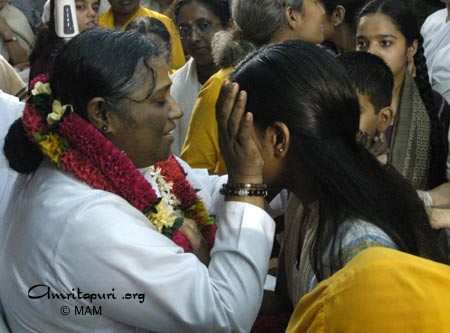 Putting it on Her forehead, Amma gave darshan to the pujari who had tears in his eyes. On the way out Amma paused before the old female temple elephant, feeding her some bananas. Then, as She stepped out of the temple, the temple authorities honored Amma, adorning Her with a beautiful silk shawl and presenting Her with sacred water of Kotitirtha. Amma touched them and offered a brief silent prayer before walking through the crowd to the caravan, after spending nearly 30 minutes in the temple. She turned around once more to gaze at Her children from inside the caravan, caressing some of the hands that were reaching out to Her. As three large eagles circled above the vehicle, Amma closed the door, leaving all with a feeling of miracle and utter joy. The 108 families living in Amrita Kuteeram, Rameshwaram were very excited. Amma was coming to give a programme just in their neighbourhood. Only a year before they had been living in leaky huts thatched with coconut leaves, but–thanks to Amma–they now had simple but strong houses in an attractive, well-maintained neighbourhood to call home. 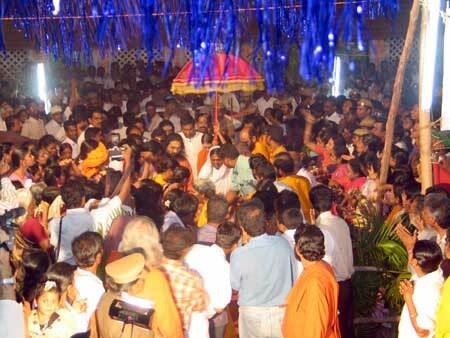 All the families were intent on properly receiving Amma when She arrived. They knew that en route to the stage Amma would drive past their homes, so each family lit an oil lamp on their portico and decorated their doorsteps and walkways with flowers. Their children sat along the path where Amma’s car would come, waiting with small flags in their hands. And when Amma’s car finally did come, each family showered it with flower petals–so many petals, in fact, that the hood and windshield of the car were covered and the driver had to run the wipers in order to see the road. Inside the car, Amma–whose window was wide open–was also covered in this physical expression of Her children’s gratitude and love. Looking at the Amrita Kuteeram residents that day, it was not so easy to tell just how poor they were. The women wore colourful saris and gold earrings, bangles and bracelets; the men had decent shirts on; the kids were neatly dressed. But then when we spoke to them, we came to understand that most of the saris were borrowed, the gold was fake and the children’s clothes were all hand-me-downs. They wanted to look nice for Amma. 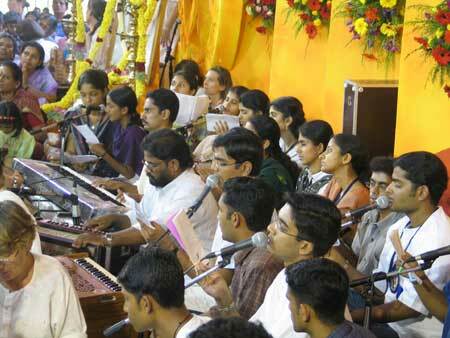 That night, all the Amrita Kuteeram residents–and other poor Rameshwaram villagers–came for darshan, Amma took a lot of time with them, inquiring about their health and their finances. So many were struggling so hard to make ends meet. 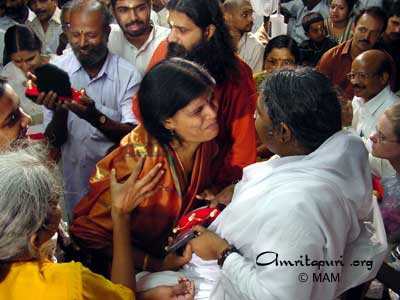 Earlier that night, Amrita Nidhi, the Ashram’s free pension programme, had been inaugurated in Rameshwaram, but many desperately poor people coming for darshan were not enrolled in the programme and Amma’s heart went out to them. So She told one of Her Swami’s to start distributing pension allotments. He took down their names and an account of their troubles; they would be processed later. 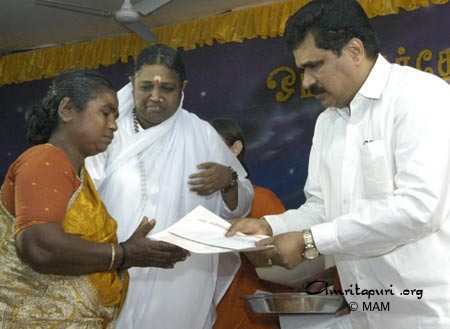 Amma had some 700 saris distributed and, even had arrangements made for some of those suffering from heart trouble to be treated at AIMS, Her super-specialty hospital in Cochin. 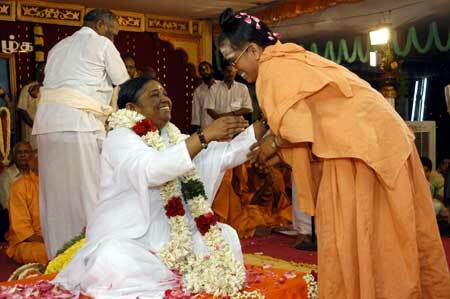 They offered flowers to Amma. Amma offered them love and hope. From one holy city to the next, India truly offers an unending stream of spiritual inspiration for the many pilgrims who travel here. 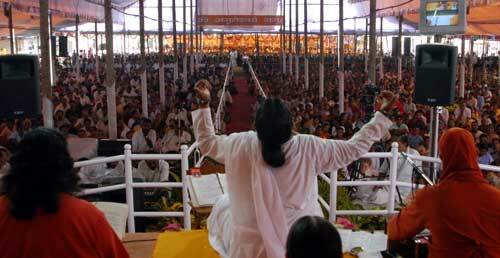 These lands of Wisdom and Light are currently being graced by one of the Wisest and Brightest ever to sanctify its ground, as Amma travels throughout on Her 2004 Tour of South India. 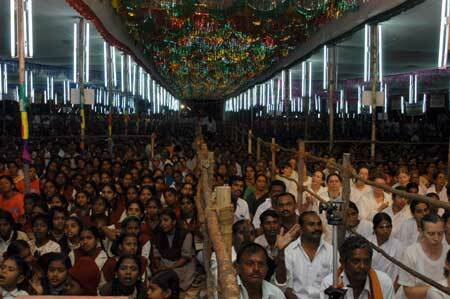 Amma arrived in sacred Rameshwaram this afternoon, the Tour’s fourth stop. Actually a narrow island attached to the mainland by the 2.2km long Pamban bridge (the longest bridge in India constructed over a bay), Rameshwaram exists atop some the most sacred soil in India. It’s unique history dates back to the time of the Ramayana, the ancient epic tale of the life of the Avatar and King of the Treta Yuga, Sri Rama, from whom it receives its name. It was here that Sri Rama worshipped Lord Shiva for His blessings with a Shiva-Lingam that is still installed in the Rameshwaram Temple. Then, with the help of his dearest devotee Hanuman and the monkey armies, began to build the bridge that was to reach Lanka, the island kingdom of the demon Ravana, over 12 km away. Ravana had abducted Sita, Sri Rama’s beloved wife and queen, and the great battle that ensued defined the age. There are a number of sites in the surrounding area directly connected to Sri Rama’s life and leela’s, all mentioned in the Ramayana, making Rameshwaram one of the most holy of India’s pilgrimage destinations. 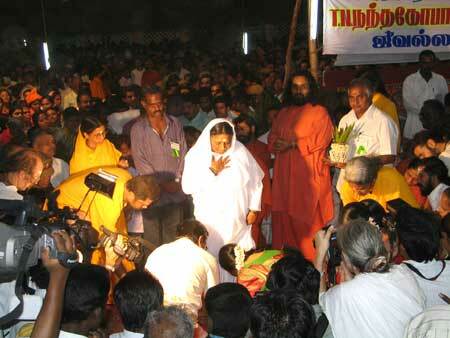 Rameshwaram has now received the blessings of a second Avatar — our beloved Amma. It is here that Amma has constructed an entire neighbourhood of free homes for Rameshwaram’s poorest, under Her Amritakuteeram housing project. Given the name ‘Amritapuram’ and adjacent to tonight’s darshan hall, its residents welcoming Amma by lining their pathways with flowers and showered petals on Amma and Her car when She arrived. This is the second year that Amma has come spreading grace through Rameshwaram the way a flower spreads its fragrance — naturally, spontaneously, beautifully. The crowds were huge… but, then, when was the last time they were small? Anywhere? It is predominantly poor villagers from Rameshwaram who come for Amma’s blessings, and with a devoted enthusiasm. 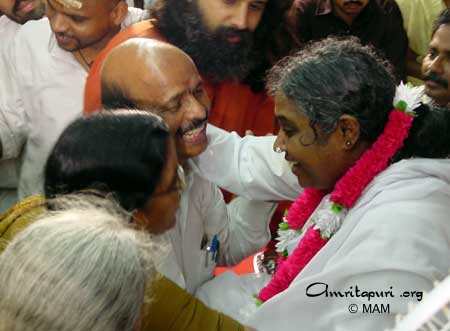 One can really see in their eyes the simple faith they have in Amma, and the comfort that they anticipate and receive from Her divine touch. One special aspect of tonight’s program is that it falls on the first day of Pongal, which is currently being celebrated throughout South India. During Satsang on the rooftop of Amma’s Madurai ashram last night, Amma told of how over the three days of Pongal a different aspect of the Divine in Nature is worshiped, partly with the symbolic offering of payasam (sweet rice pudding). The first day the Sun is worshiped as the embodiment and source of Life-Force, without which we could not be. Payasam is offered to the sun seeking his blessings, and then eaten as prasad; the second day, animals are venerated, usually through the worship of a representative cow, which again is offered sweet payasam; the third day sees the family relations worshiped, of course through more offering of payasam, and, more importantly, through the coming together of family members. If there have been arguments or miscommunications in the family, this is the day when the air is cleared and hearts are opened. It can be a very healing time, restoring a deep relationship with the Universe, Mother Nature and one another. 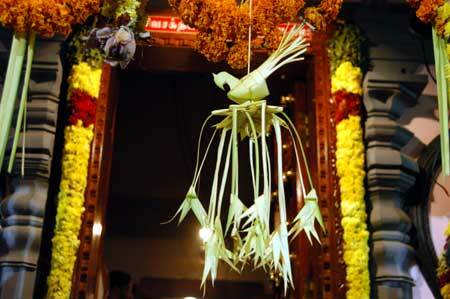 Through this festival, the Creation is recognized as the miraculous divine blessing it truly is. There must surely be a similar effect born from Amma’s traveling around the world. 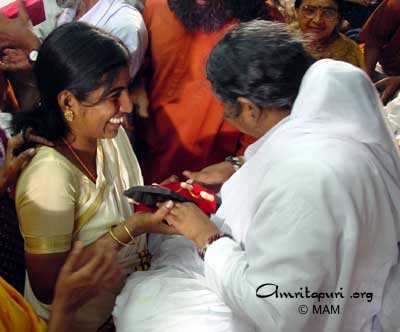 Aside from the instant sanctification that the mere touch of Amma’s Feet brings, everywhere Amma goes there are pujas and bhajans, camphor and incense are burned, prayers and mantras are chanted even while performing the most common tasks, and being in the presence of Amma creates an abundance of positive thoughts within us; all of this acts like a healing ‘steam’ rising up and spreading through the atmosphere, purifying everything on some level and to some degree. Holy places like Rameshwaram remain holy due to the faith of devotees, regular observance of the traditional rituals, and the ‘re-charging’ that is bestowed by the presence and grace of Mahatmas like Amma. 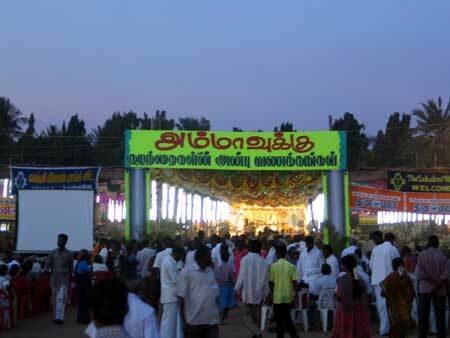 And, as Amma reaches out to such a broad spectrum of the people, drawing larger and larger crowds every year, the ‘steam’ produced no doubt grows in effect as well. This truly is a great service to the world. Amma’s wisdom is the sweetest Divine Payasam, abundant with love and appeasing the hunger of Her spiritually starved children everywhere. 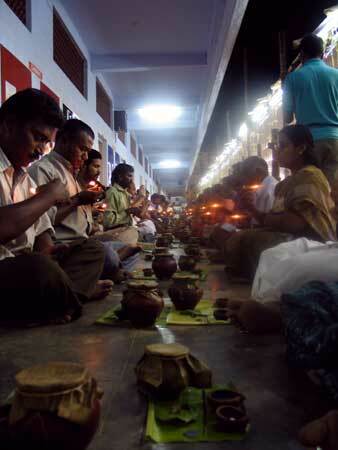 How much we enjoy depends entirely on whether we come to Amma with spoons, cupped hands or barrels. 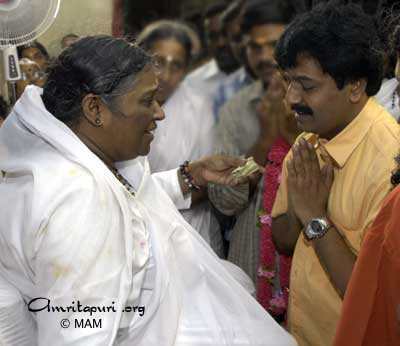 Each takes according to his or her capacity and Amma gives freely to all. After drinking their fill, the Rameshwaram devotees watched as Amma stood from Her chair, the morning sun having already risen well into the sky. Just as when She arrived, devotees sprinkled flower petals over Her as She walked to Her car, and continued to shower them over the car as it pulled away. However it wasn’t quite time to leave. Amma made a brief stop at a nearby devotee’s house and then just a few minutes away the caravan stopped again, this time in front of the famous and beautiful Rameshwaram Temple. Amma went inside, and the temple pujaris came out with wide smiles to receive Her darshan.